The incidence of hip fractures in children about 1% of total pediatric fractures. The most common cause is a high-energy trauma, such as motor vehicle accidents and falls from a height. In old cases, magnetic resonance imaging (MRI) may be needed to assess the vascularity of femoral head. Hip fractures can have deep impact on the development of hip. Vascularity of femoral head plays a vital role in the management of femoral neck fracture. The paper deals with the cited complications related to femoral neck fracture like avascular necrosis (AVN), nonunion, mal-union, and premature closure of the proximal femoral physis, leading to leg length discrepancy. Standard radiographs of hip and pelvis are usually sufficient to make the diagnosis. In old cases, magnetic resonance imaging (MRI) may be needed to assess the vascularity of femoral head. Hip fractures can have deep impact on the development of hip. Vascularity of femoral head plays a vital role in the management of femoral neck fracture. Complications related to femoral neck fracture are avascular necrosis (AVN), nonunion, malunion, and premature closure of the proximal femoral physis, leading to leg length discrepancy. However, treatment-related complications may also occur, such as infection and chondrolysis. Blood supply to femoral head in children is different from that in adults. Because of the greater impact of blood supply on the femoral neck fracture management, it has been studied extensively and described previously.,,, Postmortem injection and microangiographic studies have provided us with insights as to how the vascular anatomy changes with age. The vessels from the ligamentum teres contribute little to the vascularization of the femoral head until the age of 8 years. In adults, their contribution is around 20%, and it further decreases with age. At birth, the main vascular supply to femoral head is from the branches of the medial and lateral femoral circumflex arteries, which traverse the femoral neck and predominantly supply the femoral head. With the increasing size of cartilaginous physis, these vessels diminish gradually and this blood supply is practically nonexistent from the age of 4 years. After the age of 4 years, the lateral epiphyseal vessels predominantly supply the femoral head bypassing the physeal barrier. Two branches arise from the lateral circumflex artery, the posterosuperior (PS) and the posteroinferior (PI) branch. The medial circumflex artery anastomoses with the PS branch of the lateral circumflex artery. At the intertrochanteric groove, the medial circumflex artery ends into a retinacular system and enters the capsule. This vascular web ascends along the femoral neck to irrigate the femoral head. From the age of 3 to 4 years, the lateral PS vessels appear to predominate and supply the entire anterolateral portion of the capital femoral epiphysis. The PI and PS vessels persist throughout life and supply the femoral head. The multiple small vessels of the young child join to form a limited number of larger vessels; as a result, damage to a single vessel may lead to AVN in the older child. From the age of 14 to 17 years, the physis closes and the epiphyseal and metaphyseal vessels join to supply the femoral head and neck. In adults, there is one system that irrigates the entire femoral head. The Delbet classification was described in 1928 and was popularized in 1929 by Colonna. It describes four different types of proximal femoral fractures in children. 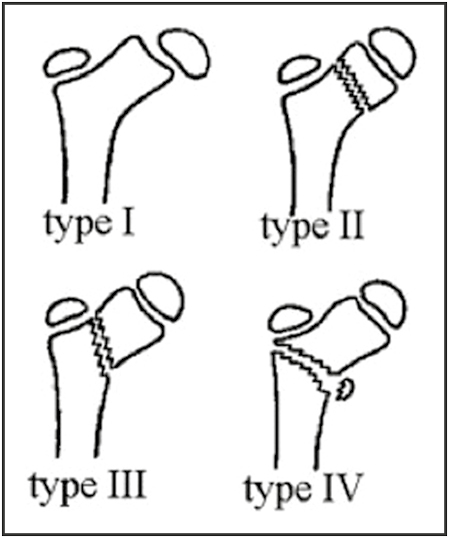 It is widely used to classify hip fractures in children [Figure 1]. A type I fracture is a transepiphyseal fracture with or without dislocation of the femoral head. Dislocation occurs in approximately 50% of these cases. This pattern of fracture is least common; conversely, in the infant, type I fractures are more common than types II, III, and IV. Diagnosis of a type I fracture may be difficult in an infant, as the femoral head is not yet ossified. Clinically, the limb is usually positioned in flexion, abduction, and internal rotation. The differential diagnosis includes developmental dislocation of the hip and septic arthritis of the hip joint. An additional investigation such as arthrogram and MRI may sometimes be necessary to diagnose this kind of fracture. The low incidence of these injuries may be the reason why a universal treatment protocol has not yet become available. After the first description by Cromwell in 1885, only a few reports were published until half of the 20th century, and all these patients were treated nonoperatively.,, Until the 1970s, it was recommended that all non- or minimally displaced fractures should be treated with cast immobilization. Closed reduction and a plaster spica cast were recommended for displaced transcervical and cervicotrochanteric fractures. A recently published article shows that fair results still can be obtained with conservative treatment; however, less adverse effects are noted when operative treatment is used. Fixation with smooth pins is indicated for fractures without displacement as well. Conservative management with plaster spica cast, however, also remains an option. In two articles by Feigenberg et al. and Forlin et al., results of conservative treatment with skin traction or hip spica were fair in most patients with no comparison made with operative treatment. For hip fractures with dislocation of the femoral head, a gentle closed reduction can be attempted; after which, the head is fixed with a smooth pin. If closed reduction fails, an open reduction with pin fixation is recommended using anterior approach to prevent damage to the blood supply of femoral head, which additionally decompresses the hip joint., However, there is still no consensus that urgent decompression of the joint reduces the rate of complications, such as AVN. Type II fractures should be treated with anatomical reduction and stable fixation to minimize the risk of late adverse effects., However, good to fair results have also been reported with conservative treatment., In fractures with substantial displacement, results are poor with conservative management. There is a high incidence of AVN, coxa vara, or secondary displacement.,, Canale and Bourland reported a decrease in complications in all nondisplaced or displaced, type II fractures, after reduction and internal fixation by pins or screws. Heiser stated that if it is necessary to bridge the physis, it is preferable to do so with smooth Kirschner wires to prevent premature closure of the physis. An anterior capsulotomy could reduce the occurrence of AVN in these fractures. When an open reduction has to be performed, the approach according to Watson-Jones is to be preferred. Type IV fractures results are favorable with reduction and fixation because of their inter- and subtrochanteric location. AVN is the most frequent and serious complication of proximal femoral fractures in children, with an incidence of 17%–59%. The chance of AVN occurring after a fracture is directly related to the amount of initial displacement, or the displacement as a result of the reduction attempts, delay in fracture treatment, type I or displaced type II fracture, and age of more than 10 years.,, However, there are authors who regard the type of treatment of greater importance than the type of fracture. The adjunct of decompression of the hip joint has not yet been proven to reduce the incidence of AVN. Ogden recommends repeat bone scan at 3 and 12 months. Ratliff described three types of AVN after a hip fracture. In type I, the entire femoral head is involved. Type II involves only a portion of the head. There is a zone of AVN from the fracture line to the physis in type III. The Ratcliff classification type I has the worst prognosis. The consequences of AVN can be devastating and further treatment may be needed. If internal fixation is in place when AVN develops, it should be removed after union of the fracture. Remodeling of the femoral head may occur, especially in the younger child, but may take up to 5 years. Maeda et al. proposed a non-weight-bearing regime for more than 1 year to avoid severe collapse. In a number of cases not responding to conservative treatment, management may be necessary to perform a rotational osteotomy or even a total hip replacement. Malunion may occur after conservative or surgical treatment of a proximal femoral fracture, which is mainly of two types, coxa vara and coxa valga. Coxa vara occurs in 20%–30% of all pediatric hip fractures. The incidence of coxa vara decreases when internal fixation is performed in fractures with displacement. Coxa vara may develop secondary to AVN, nonunion and premature physeal closure, or a combination of all above. Severe coxa vara shortens the limb causing abductor weakness that may result in early development of osteoarthritis of the hip—severe coxa vara causes shortening of lower limb which leads to abnormal forces over that particular hip while walking and leads to early OA of the Hip. Remodeling of the hip can be expected in the very young child. If the neck shaft angle is 110° or less, a subtrochanteric valgus osteotomy may be considered as suggested by Canale and Bourland and Morrissy. Coxa valga has been described in one study in which the cause of the malunion was iatrogenic. Nonunion may occur in hip fractures in children with an incidence of 6%–10% of all pediatric hip fractures.,,, Primary cause of nonunion is failure to obtain, or maintain, anatomical reduction mainly in displaced fracture. In a series of 16 fractures in 16 children published by Forlin et al., 7 nonunions were described and 6 were displaced type II fractures. Nonunion should be treated operatively, unlike AVN, as soon as possible. Valgus osteotomy usually leads to secondary union. Bone grafts can be used if necessary. In an attempt to minimize the occurrence of AVN and nonunion, Qi et al. used a vascularized greater trochanter periosteal flap transposition. They achieved excellent to good union rates in 87%. They stated that this method may accelerate union and may decrease AVN. Premature closure of the proximal femoral physis has been reported in 5%–65% of all pediatric hip fractures. The prevalence increases when the physis is bridged by osteosynthesis material. It also increases in the presence of AVN. When crossing the physis, internal fixation is necessary, and pins are preferred to cannulated screws– In order to achieve better fixation in pediatric neck femur fracture one may have to cross the epiphysis and so pins are preferred over screws which causes less damage to the growth plate. Beaty however stated that it is more important to have stable fixation than sparing the physis. Premature closure of the physis leads to leg length discrepancy. Contralateral epiphysiodesis may be necessary when leg length difference becomes more than 2.5cm. Although pediatric hip fracture is not a large burden in the orthopedic traumatology, because of precarious blood supply its behavior is notorious. The potential adverse events following these fractures are of great implication to the growing child. We should manage these fractures very aggressively. One should prefer fixation rather than conservative management, as conservative management carries higher risk for failure of reduction. Whatever approach we are using in displaced fracture, anatomical reduction must be the priority; thus, one should not hesitate doing open reduction if closed reduction is not leading to anatomical reduction. Stability of fixation device is also important, so one can cross the physis while fixation in order to make fixation stable. Frequent clinical and radiological management is also important in femoral neck management in order to identify and manage the complications as early as possible. It would also be interesting to have a standardized treatment protocol for hip fractures in children, mainly because of their low frequency and their high rate of complications. Davidson BL, Weinstein SL. Hip fractures in children: A long-term follow up study. J Pediatr Orthop 1992; 1: 355-8. Blasier RD. Fractures of the hip. In: Beaty JH, Kasser JR eds. Rockwood and Wilkin’s Fractures in Children. 5th ed. Philadelphia, PA: Lippincott Williams & Wilkins; 2001. Román M, Recio R, Moreno JC, Fuentes S, Collantes F. Stress fracture of the femoral neck in a child. Case report and review of the literature. Acta Orthop Belg 2001;1:286-9. Roposch A, Saraph V, Linhart WE. Treatment of femoral neck and trochanteric simple bone cysts. Arch Orthop Trauma Surg 2004;1:437-42. Whitman R. I. Further observations on depression of the neck of the femur in early life; including fracture of the neck of the femur, separation of the epiphysis and simple coxa vara. Ann Surg 1900;1:145-62. Tachdjian MO. Fractures of the neck of the femur. In: Tachdjian MO ed. Pediatric Orthopedics. 2nd ed. Philadelphia, PA: Saunders; 1990: 3231-47. Trueta J, Amato VP. The vascular contribution to osteogenesis. III. Changes in the growth cartilage caused by experimentally induced ischaemia. J Bone Joint Surg Br 1960;1:571-87. Trueta J, Trias A. The vascular contribution to osteogenesis. IV. The effect of pressure upon the epiphysial cartilage of the rabbit. J Bone Joint Surg Br 1961;1:800-13. Vigler M, Weigl D, Schwarz M, Ben-Itzhak I, Salai M, Bar-On E. Subtrochanteric femoral fractures due to simple bone cysts in children. J Pediatr Orthop B 2006;1:439-42. Ogden JA. Changing patterns of proximal femoral vascularity. J Bone Joint Surg Am 1974;1:941-50. Chung SMD. The arterial supply of the developing proximal end of the human femur in childhood. A report of six cases. Ann Surg 1928; 1: 902-907. Colonna PC. Fractures of the neck of the femur in children. Am J Surg. 1929; 1:793-797. Canale ST, Bourland WL. Fracture of the neck and intertrochanteric region of the femur in children. J Bone Joint Surg Am 1977;1:431-43. Fiddian NJ, Grace DL. Traumatic dislocation of the hip in adolescence with separation of the capital epiphysis. Two case reports. J Bone Joint Surg Br 1983;1:148-9. Ratliff AHC. Fractures of the neck of the femur in children. J Bone Joint Surg 1962;1:528-542. Hoekstra HJ. [Fractures of the proximal part of the femur in children and adolescents]. Ned Tijdschr Geneeskd 1988;1:401-4. Ingram AJ, Bachynski B. Fractures of the hip in children; treatment and results. J Bone Joint Surg Am 1953;1:867-87. Lam SF. Fractures of the neck of the femur in children. J Bone Joint Surg Am 1971;1:1165-79. Pförringer W, Rosemeyer B. Fractures of the hip in children and adolescents. Acta Orthop Scand 1980;1:91-108. Cromwell BM. A case of intracapsular fracture of the neck of the femur in a young subject. NC Med J 1885;1:309. Pape HC, Krettek C, Friedrich A, Pohlemann T, Simon R, Tscherne H. Long-term outcome in children with fractures of the proximal femur after high-energy trauma. J Trauma 1999;1:58-64. Trueta J, Morgan JD. The vascular contribution to osteogenesis. I. Studies by injection method. J Bone Joint Surg 1960;1:97-109. Shrader MW, Jacofsky DJ, Stans AA, Shaughnessy WJ, Haidukewych GJ. Femoral neck fractures in pediatric patients: 30 years experience at a level 1 trauma center. Clin Orthop Relat Res 2007;1:169-73. Feigenberg Z, Pauker M, Levy M, Seelenfreund M, Fried A. Fractures of the femoral neck in childhood. Results of conservative treatment. J Trauma 1977;1:937-42. Forlin E, Guille JT, Kumar SJ, Rhee KJ. Complications associated with fracture of the neck of the femur in children. J Pediatr Orthop 1992;1:503-9. Calandruccio RA, Anderson WE III. Post-fracture avascular necrosis of the femoral head: Correlation of experimental and clinical studies. Clin Orthop Relat Res 1980;1: 49-84. Soto-Hall R, Johnson LH, Johnson RA. variations in the intra-articular pressure of the hip joint in injury and disease. A probable factor in avascular necrosis. J Bone Joint Surg Am 1964;1:509-16. Forster NA, Ramseier LE, Exner GU. Undisplaced femoral neck fractures in children have a high risk of secondary displacement. J Pediatr Orthop B 2006;1:131-3. Canale ST. Fractures and dislocations. In: Canale ST, Beaty JH eds. Operative Pediatric Orthopedic Elsveier: St Louis, MO; 1991: 885-899. Heiser JM. Fractures of the hip in children: A review of forty cases. Clin Orthop Relat Res 1980; 1: 177-184. Bombaci H, Centel T, Babay A, Türkmen IM. [Evaluation of complications of femoral neck fractures in children operated on at least 24 hours after initial trauma]. Acta Orthop Traumatol Turc 2006;1:6-14. Flynn JM, Wong KL, Yeh GL, Meyer JS, Davidson RS. Displaced fractures of the hip in children. Management by early operation and immobilisation in a hip spica cast. J Bone Joint Surg Br 2002;1:108-12. Togrul E, Bayram H, Gulsen M, Kalaci A, Ozbarlas S. Fractures of the femoral neck in children: Long-term follow-up in 62 hip fractures. Injury 2005; 1: 123-130. Bagatur AE, Zorer G. Complications associated with surgically treated hip fractures in children. J Pediatr Orthop B 2002;1:219-28. Ratliff AHC. Complications after fractures of the femoral neck in children and their treatment. J Bone Joint Surg 1970; 1: 175. Hughes LO, Beaty JH. Fractures of the head and neck of the femur in children. J Bone Joint Surg Am 1994;1:283-92. Maeda S, Kita A, Fujii G, Funayama K, Yamada N, Kokubun S. Avascular necrosis associated with fractures of the femoral neck in children: Histological evaluation of core biopsies of the femoral head. Injury 2003;1:283-6. Morrissy RT. Fractures of the hip in childhood. Instructional course lectures, AAOS 1984; 1: 229241. Mirdad T. Fractures of the neck of femur in children: An experience at the aseer central hospital, Abha, Saudi Arabia. Injury 2002;1:823-7. Boitzy A. Fractures of the proximal femur. In: Boitzy A ed. Treatment of Fractures in Children and Adolescents. Springer: New York; 1971: 254-267. Qi B, Yu A, Zhang G, Yu G, Shi Y, Zhu S, et al. The treatment of displaced femoral neck fractures with vascularized great trochanter periosteal flap transposition in children. Microsurgery 2008;1:21-4. Beaty JH. Fractures of the hip in children. Orthop Clin North Am 2006;1:223-32, vii.